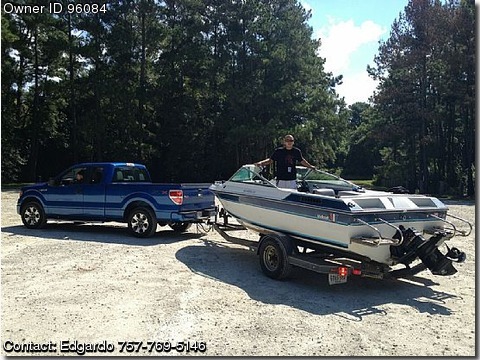 Call Boat Owner Edgardo 757-769-5146.Description: 1986 Wellcraft American bowrider and 1986 Road Runner trailer. Mercruiser 3.0 rebuilt Aug of this year with only 5 hours. Tons of extras to include..new in 2013 GPS, fish/depth finder, DNR Equipment ie. flares, life vests, paddles, New prop, ski pole, rope, and wake board, 2 anchors, a hand full of mooring lines, 2 batteries, battery switch not yet installed, runs great, available for test drive today. Interested to trade as well. Just let me know what you have. Money talks make me an offer. Worse I can say is no.